Those who enjoyed the Fate/Stay Night visual novel now have an artbook to check out. This is the English edition for the Japanese artbook Fate/complete material I Art material which wasn't favourably reviewed on Amazon Japan. This thick 240-page paperback artbook collects the illustrations, character designs, pin-ups and promotional art from Fate/stay night PC version game. Generally speaking, the content splits into three main parts. The first part covers a lot of the cutscene illustrations from the three storylines, namely Fate, Unlimited Blade Works and Heaven's Feel. 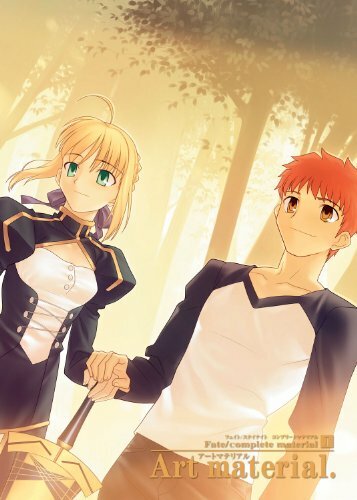 Because the Fate franchise is so huge, the book feels incomplete without the inclusion of content from other properties such as the manga or anime. There's nothing on the Fate/stay night Réalta Nua for Playstation 2, Fate/Zero. The second part features more of the visual effects. These are things like different variations of the cutscenes, e.g. characters in similar poses but different costumes, settings. There are also backgrounds, and several pages of motion effects for bursting light, blood, glow, flying chains. The last part has the promotional art. The full page illustrations are drawn in splash art style. The artworks here are way better than the video game stills that form more than half the book, at least the characters here look more dynamic, and since they are for promotion, they should be. The more unusual artworks here are those for servants where the style is less manga and anime-like. There's quite a lot of blood in the artworks, and graphic enough for me to make a mention here. Besides the occasional quotes from the game, there are no text explaining anything or captions for the illustrations. Ultimately, this artbook should appeal mainly to those who have played the game, and to those who don't mind in-game stills, for the first part of the book includes cutscenes illustrations that would only make sense if you have seen them before.